High performance bearing with nylon cage. One flask pre-removed for easyer maintenance. In 1980, two hockey brothers from Minnesota founded Rollerblade®. Quickly, hockey players were turning heads in the streets of Minnesota in the summer. Cross-country skiers and alpine skiers have also adopted the sport as a training supplement. In the 1990s, the market continued to grow, with in-line skating events, competitions and other activities specifically related to sport, including the development of the "aggressive" skating trend. Since, the brand has progressed well approaching the world of skiing, both development, design and marketing. 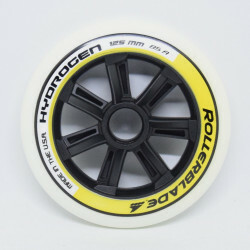 Today Rollerblade® is still one of the big leaders in the inline roller skating market and the brand continues to develop its products for an ever more specialized practice.